MacRitchie Reservoir Park is one of the Singapore’s finest areas of secondary rainforest and a splendid place for a stroll on a Sunday morning. Ann was clearly expecting a different kind of rainforest so lack of interest re-routed our perambulations along the boardwalk. At the point where we turned round, I stopped to photograph a small group of monkeys. 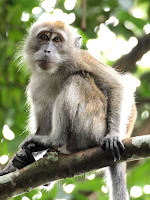 One elderly monkey, who was sporting a fine white handlebar moustache, was happy to pose but became distracted by the occasional dog passing underneath his branch. The dogs were minding their own business until the hissing from the whiskery chap caused the dog walkers to panic which in turn flustered the dogs which raised tensions among the monkeys. A bit too much nature for some people, I suspect.